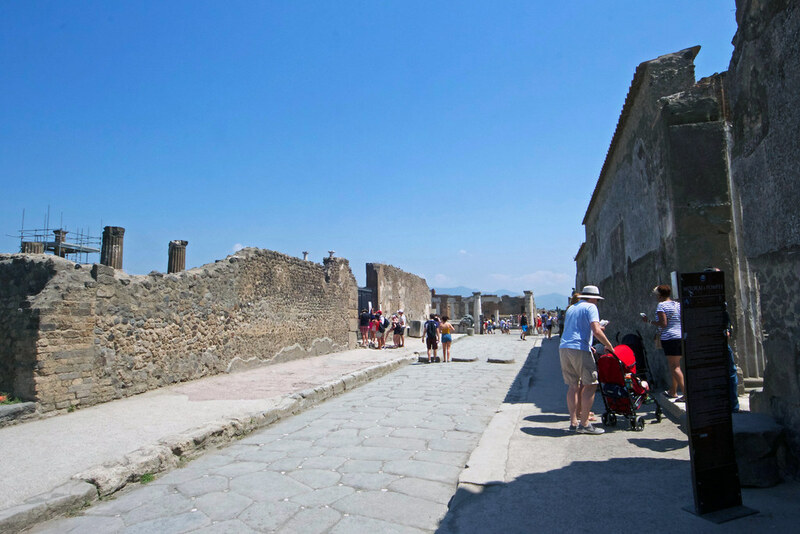 A half hour train from Sorrento takes you into the city of Pompeii, then another forty five minute wait, if you go at the peak time gets you into the ancient city’s ruins. I’m not a passionate history buff but what amazes by being in a location like this is, one, I’m walking through an entire city (and civilisation) that has been built before modern machinery and our understanding of architecture, and two, we have the brains and skills to work out a historical narrative based on piecing together uncovered evidence. Again, another hot day greeted us as we walked through the ruins. We spent roughly four hours, but could have easily spent more time there – if you think about it, you are walking through an entire city. There are obviously tour guides that can show you around and tell you stories, plus also audioguides but we found the comprehensive book that marks all the different sites just as useful and informative. 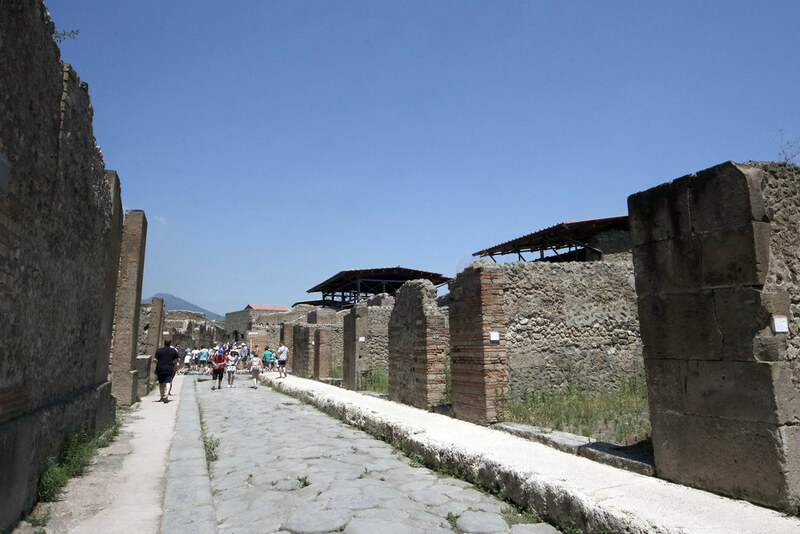 In the distance when you walk around, the giant figure of Mount Vesuvius – the volcano that smothered the area in ash and dust – looms in the background. 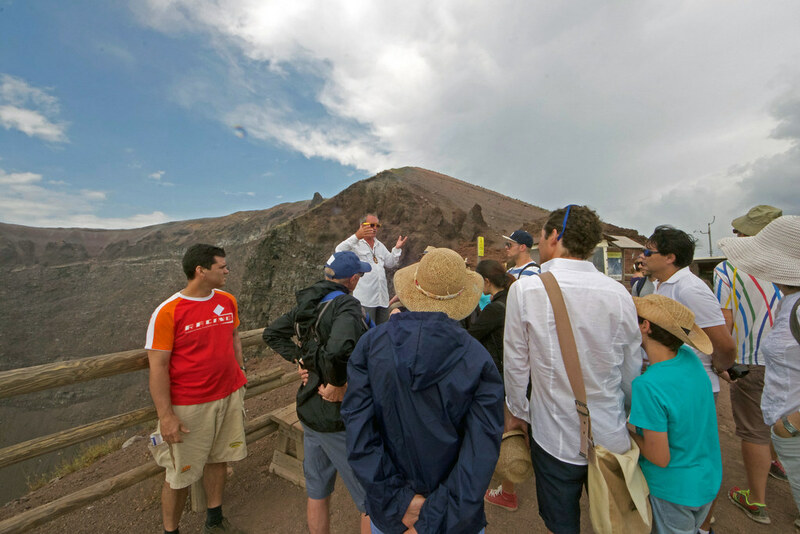 Tourist buses leave from Pompeii train station to take you to the (active) volcano. Some of these drop you off the base, and others, get you up and in to the crater but you’ll have to pay a bit more (about €22). 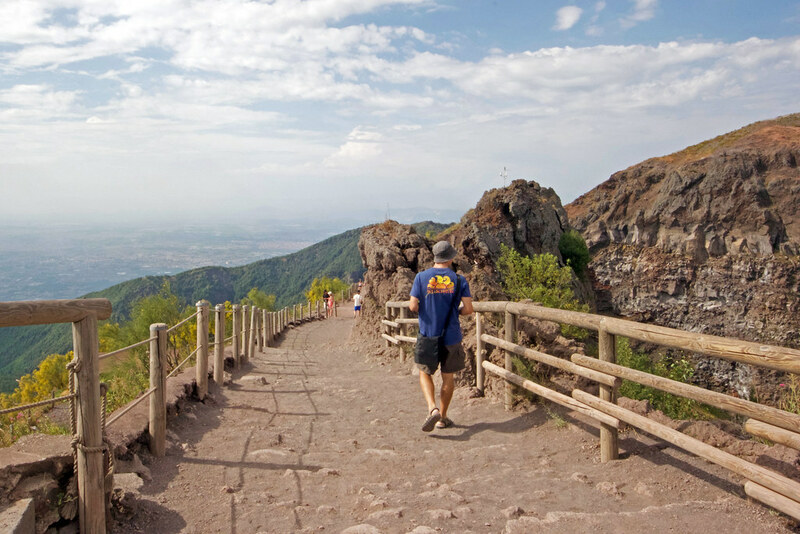 The latter is worth it, because you don’t just want to go to the base, there’s more to see and hear about further up Vesuvius. The Volcano, which was dormant for so long that no one knew was an active volcano – a devastating outcome! The view from the top can be a little obstructed because of cloud cover. Expect it to a bit cooler and there to be a bit of drizzle/precipitation as well. You’ll get to walk around a crater, and in particular locations, steam various warm air patches will remind you that the geological structure is very much alive. From the top be sure to locate Pompeii and how far (or close) modern cities have set up!! Although our spectacular guide did alert us to the speediness of evacuating the 800 thousand residents in case of volcanic activity. Be prepared for a bumpy ride to the top. Not just the cobblestones but the road to the crater is not sealed – so perhaps avoid a big lunch. Set aside half a day for both and if it is a hot day, be sure to pack a bottle of water! You’ll do a bit of walking but definitely a location to add to your Italian roadtrip.